Summer is almost here, and with the incredible warm weather comes later bedtimes, less rushing to activities, and a general sense of freedom for all. While we can’t wait to abandon our school routine and jump in the pool, it’s important to remember potential dangers that come along with the summer months. 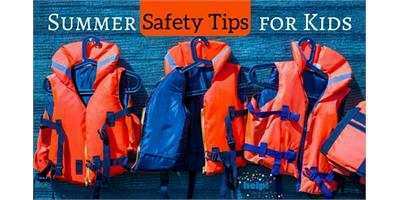 May 30 until June 5 is Safe Kids Week, so we rounded up some great summer safety tips across a range of categories to review with the family. Keep these ideas – and a fresh layer of sunscreen – at the top of your mind. Then you can go back to the important things, like deciding between one scoop or two! Insert eye roll here if you’d like, but older kids and teens are prone to making bad decisions when it comes to summer safety. Inspector Chris Boddy, currently in his 25th year with the Toronto Police, has seen it all in the communities he’s served, and offers tips for your teens that go well beyond the summer. We all want to be outside as much as possible in the summer and teens are no different. Make sure they know which spots are off limits for nighttime chilling, such as parking lots and alleyways, and of course, talk to them about alcohol use, especially when it comes to driving or being in and around water. When it comes to water safety, kids need to read the signs – that includes the ones at the pool and the ones their bodies are giving them. Walking not running, being aware of underwater traps such as ladders, and knowing water depth before you dive are par for the course, but there’s more to keep in mind. Wearing the right helmet for different activities is equally important. Skateboard helmets are designed with extra cushioning at the back of the head, where most injuries occur, and are able to withstand multiple falls. In bicycle mishaps, the forehead usually makes first contact with the ground, so bike helmets are designed to provide extra cushioning up front, but must be replaced after one crash. With summer comes chaotic trips to amusement parks, beaches, and festivals galore! These events are almost always staffed with police officers or security. Take the time to point out these community figures to your kids, in case they get separated from you, and don’t hesitate to introduce your kids to a police officer on the premises, who will be more than happy to say hello and reinforce the rules for your little ones. Create an easy-to-remember secret family password, just in case your kids encounter any strangers with ill intentions to lure them away, and negotiate very clear rules, meeting spots, and times for older kids and teens who are allowed to venture around on their own. Following safety tips and learning new safety skills doesn’t have to be a drag. Luckily, there are tons of safety- or skills-development programs during summer months that your kids will love! Toyota’s kartSTART program, developed by retired racecar driver Russ Bond and taking place at speedways across the country all summer long, focuses on establishing a solid foundation for safe and responsible driving habits in a fun and exciting way for kids ages 10–16 by letting them learn the ropes in a vehicle just their size: a go kart! Bike safety programs, like PedalHeads, offer safe, fun, and challenging learn-to-ride bike camps for kids 2–12. Using their tried and true methods, their small classes and exceptional instructors are guaranteed to get your kids off training wheels, riding like pros, and instilling every important bike safety rule you can think of into their helmet-covered heads! St. John Ambulance also offers a variety of safety courses useful for summer months, from Babysitting Basics for tweens, to Wilderness First Aid, which teaches kids to adapt first-aid skills based on availability of supplies, the environment, and additional factors encountered in a remote setting. Most provincial parks across the country offer unique ‘Learn to Camp’ programs, so you can try camping for the first time in a safe and fun environment and participate in activities like setting up, cooking meals, and lighting campfires. As with any planned vacation, make sure loved ones know details about your plans and expected return date. And make sure you’re aware of all regulations regarding fishing, fires bans, and waste disposal before you go. Looking to brush up on your safety skills in general? Visit the Canada Safety Council for endless resources and tips too!